Whenever someone asks what decade I'd love to live in, my answer is always the Roaring Twenties — and I don't think I'm the only one. Something about the swinging fringe dresses, bold haircuts, and notable architecture creates the mental image of a time when it was genuinely fun to be alive, and the jewelry of the art deco era reflects that air of modernization and celebration. With the end of the first World War, design began to take new shapes as artists and jewelers abandoned naturalistic and classic forms of the 1800s in favor of a modern, streamlined look that reflected the technology and architecture of the age. 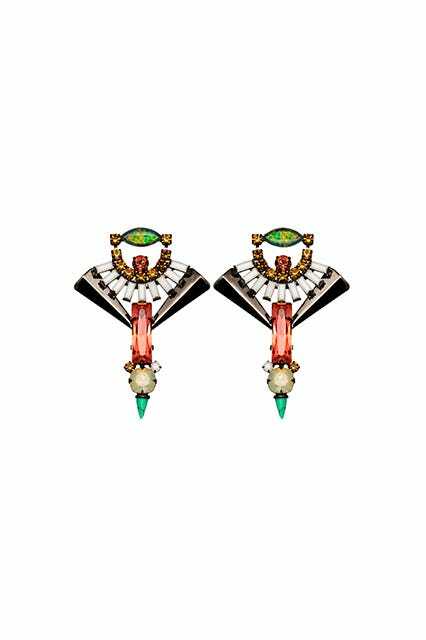 But despite the bold colors, unique shapes, and often-masculine cuts, Art Deco jewelry has become a classic in fashion — and beyond. While some brides-to-be search high and low for the perfect, authentic vintage Deco engagement ring, contemporary jewelry designers have also pulled inspiration from the age and translated it into modern pieces suitable for more everyday wear. So, with the help of Elizabeth Doyle, founder of Doyle & Doyle, jewelry designer Erica Weiner, and the experts at Lang Antique & Estate Jewelry, we've rounded up some of the most statement-making Deco-inspired pieces for you to treasure for years to come. And to make it even easier, it's all broken down into the five most noteworthy characteristics of '20s-inspired jewelry that you should keep in mind when you're shopping for your own gems. Get ready for some serious sparkle. Bold, geometric shapes define the Art Deco era, which lasted from about 1920-1935. "Influenced by industrialization and the introduction of new machinery, along with the popularity of Cubism, Art Deco jewels often relied on strong geometry and symmetry for its bold designs," Elizabeth Doyle explains. 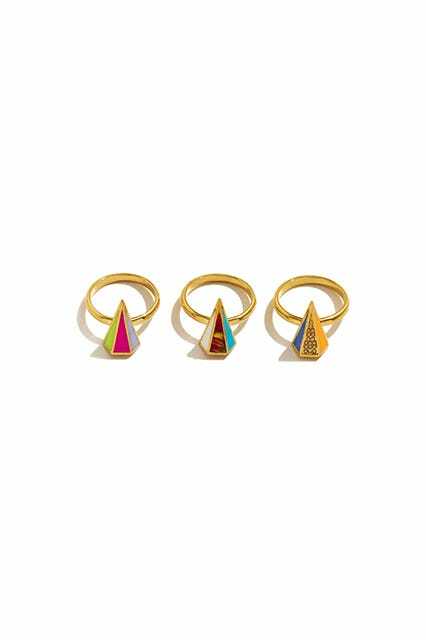 This striking, geometric jewelry goes hand-in-hand with the architecture trends of the time. "These symmetric shapes often had an upward-moving shape — similar to the top of the Chrysler Building, the most famous Art Deco skyscraper," Erica Weiner remarks. Also reflected in the Chrysler Building is the shift away from yellow gold toward white metal, which began to feel old-fashioned to some in the Art Deco era. 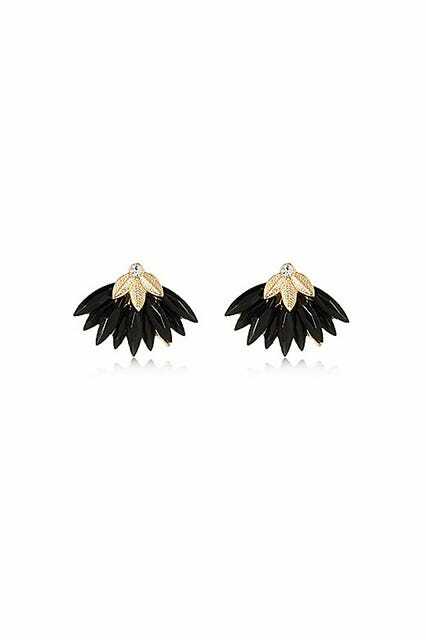 These dangling earrings are gorgeously symmetric and this fan shape is something you'll see in a lot of Art Deco-inspired jewelry. Not to mention the use of bold color combinations which became popular at that time. A hand chain makes an unexpected statement, and this style exemplifies both the geometric shapes and movement away from yellow gold that became common in the Deco age. Its shape also mirrors that upward stacking movement of the top of Chrysler building. This ring is Art Deco in every way. 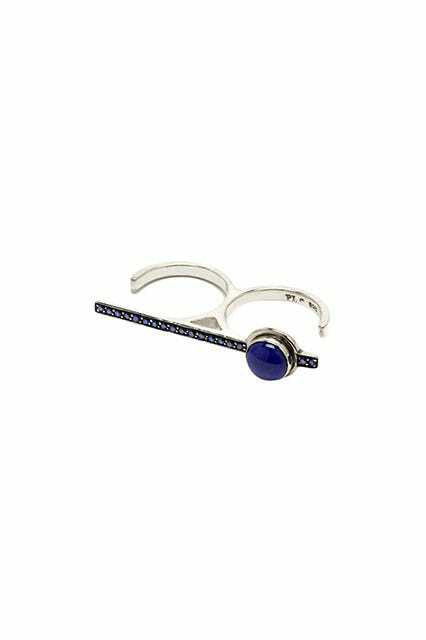 From the interesting layering of shapes to the use of sapphire as an accent to the diamonds, a cocktail ring like this one will be a staple for years to come. For a more modern, minimal take on geometry, try a set of stackable rings with simple geometric shapes, as opposed to the more intricate, sparkling designs common to a lot of costume jewelry. Not all Deco-inspired jewelry has to be over-the-top glamorous — this set is perfect for day-to-day wear, whether you wear all three or just one at a time. Again, if bling isn't your thing, try a little Deco for your neck. If you've ever been to Miami, you'll see that these colorful, geometric shapes resemble much of the architecture used throughout the city. 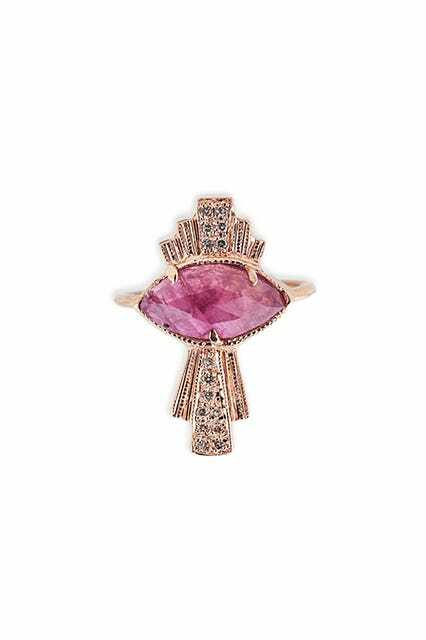 One of the most obvious characteristics of Art Deco jewelry is the use of vibrant, highly saturated gemstones, from emeralds to rubies and everything in-between. "During the Art Deco period, there were a lot of technical advancements that made synthetic colored gems extremely vibrant and more affordable, and labs got better at making them," Erica Weiner explains. While some today may think synthetic gemstones carry a negative connotation, people in the '20s were really excited about them because they felt new, trendy, and modern. "When you could make these bright, synthetic gems and combine them with the uniquely cut shapes, geometry, and symmetry of the time, it created pieces that felt joyous, vibrant, and jubilant," Weiner adds. This jewelry reflected the mood of the decade. "The Roaring Twenties were a time of prosperity and exuberance. Women won the right to vote nationally in 1920 and embraced their newfound rights in part by shedding restrictive fashions." That meant ditching the traditional, yellow gold jewelry of the past and opting for more daring, exciting trends when it came to jewelry and fashion in general. We've never met an ear jacket we didn't like. These Dannijo earrings use deeply saturated Swarovski crystals that reflect the popularity of vibrant gemstones in the 1920s. 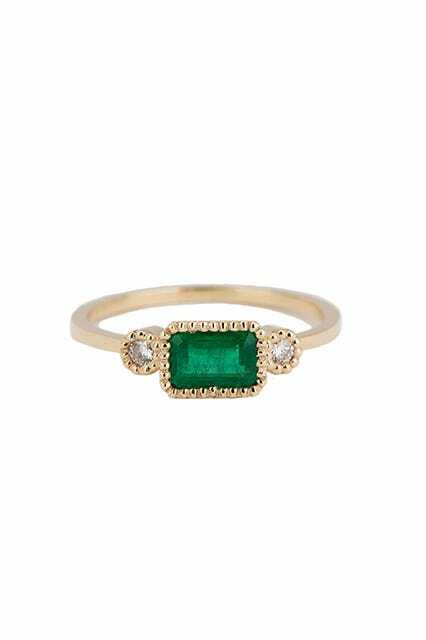 Add an emerald to your ring stack. 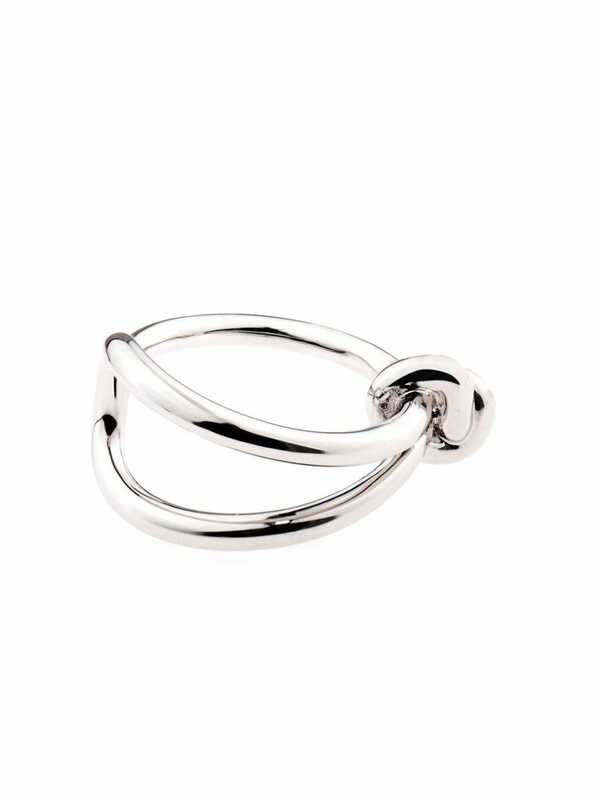 This double-finger ring has a more streamlined, understated Deco feel. It encapsulates the use of geometry and bright colors, but doesn't feel at all contrived or overly glamorous. This saturated pink gemstone has a feminine feel and the accent shapes are architecturally inspired. 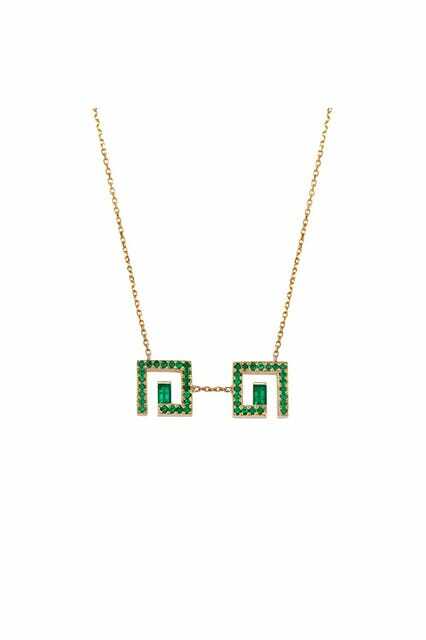 This delicate emerald sparkler is perfect for layering with other gold necklaces, which women also did in the '20s. Especially for parties or special occasions, layers of necklaces of various materials and lengths made a festive statement that complemented the movement of flowing, fringed skirts. Also popular in the 1920s and '30s was the use of stones alongside diamonds to create an impactful contrast. Turquoise, black onyx, jade, ivory, coral, and quartz could all create dynamic, geometric pendants and statement rings when used as an accent or made to surround a central diamond. 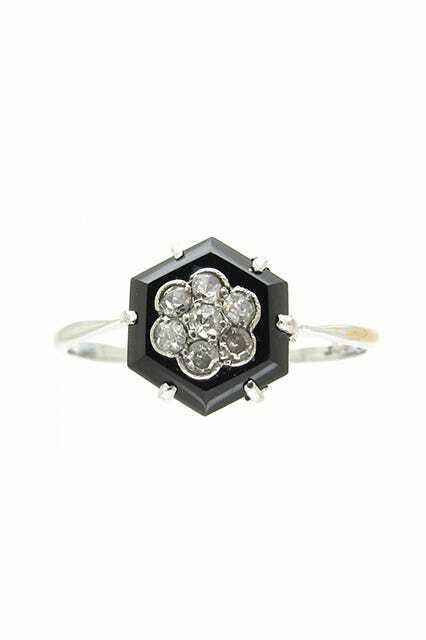 "One of our best-selling rings uses white metal and a diamond surrounded by black onyx," Weiner says. These combinations were also influenced by The Ballet Russe, which used bright colors in its costuming. "The Ballet Russe was influential to designers in all disciplines, and certainly its influence can be seen in the choice of bold color combinations in many Art Deco jewels," Doyle explains. A toughened-up take on the diamond ring, similar to the one Erica Weiner described. Dress up a blazer with a pair of studs. 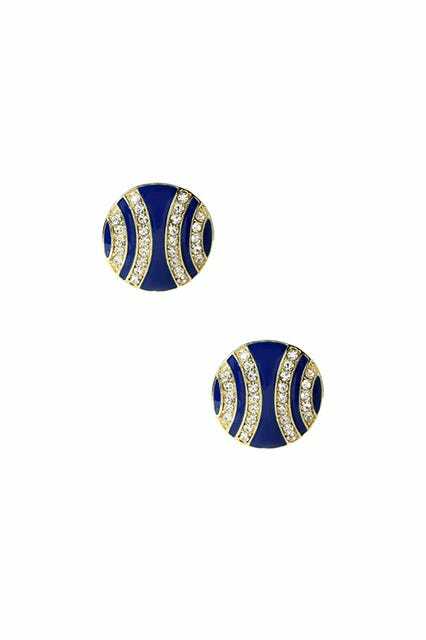 The geometric pattern of the diamonds combined with the deep blue background make these Deco earrings way more interesting than your typical solitary stud. 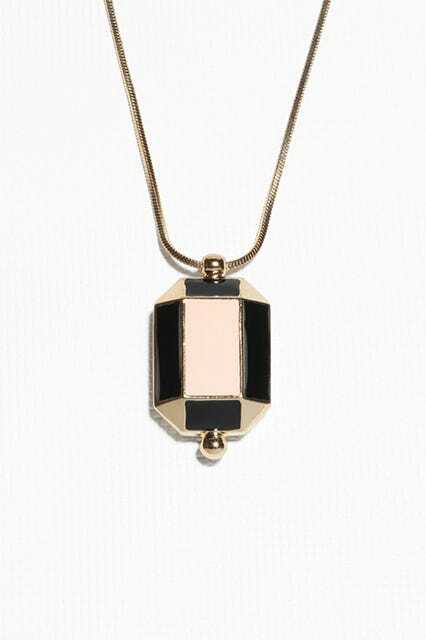 This colorblocked pendant goes with everything and is a more contemporary take on the glamorous pendant necklaces that flappers often wore. 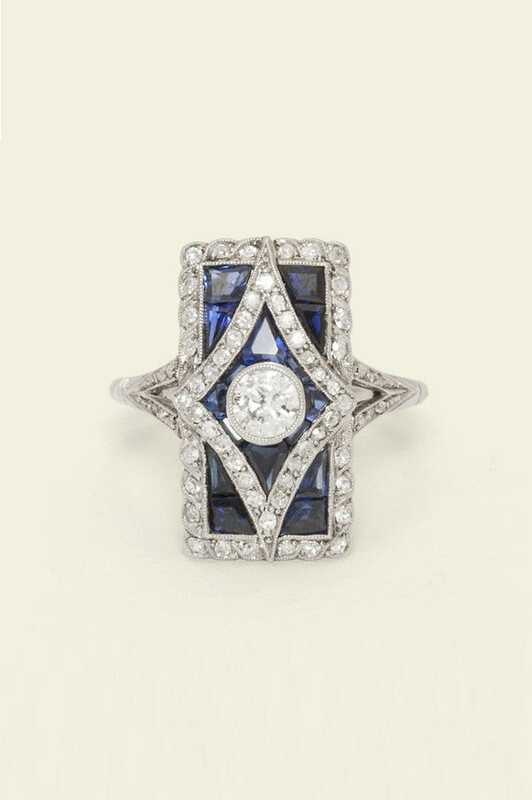 We love how this ring uses sapphire to frame a simple, round diamond. And even though it's gold, it feels anything but old-fashioned. Mociun Sliced Hexagonal Sapphire Ring, $2,050, available at Mociun. 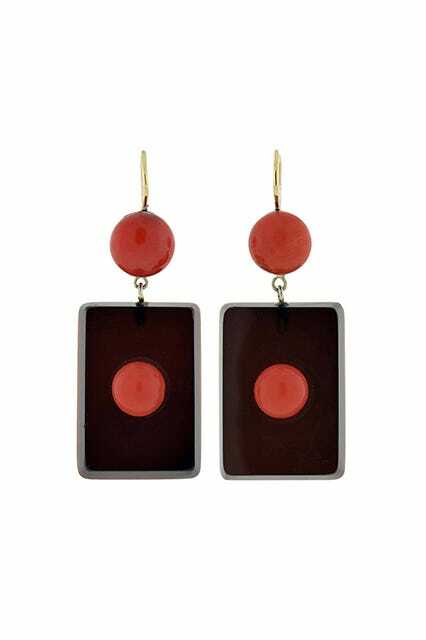 These daring earrings exemplify the bold contrast and geometry of the 1920s, especially thanks to the use of coral. The fanned shape and use of black alongside a metal accent is very Art Deco. Though much of Art Deco jewelry took masculine and geometric forms, other abstracted and modernized floral designs came about, as well, using elements from the Art Nouveau wave. "These pieces were usually organic shapes and literal organic forms, like curved lines, leaves, vines, grapes, and nymphs," says Erica Weiner. "And a lot of it was actually asymmetrical." Some even used yellow gold instead of the more popular platinum and white gold of the art deco age. However, these floral and abstract designs still kept the balanced, polished look that art deco became known for. 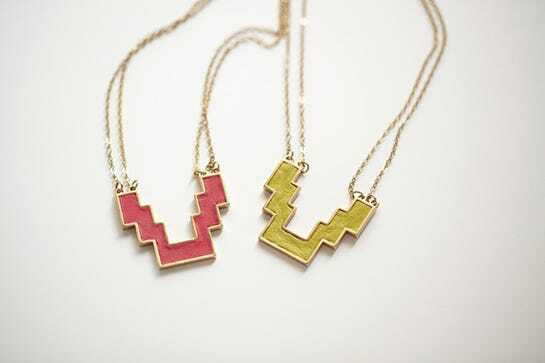 Today, these shapes can be found in both fast fashion and high-end designer jewelry. 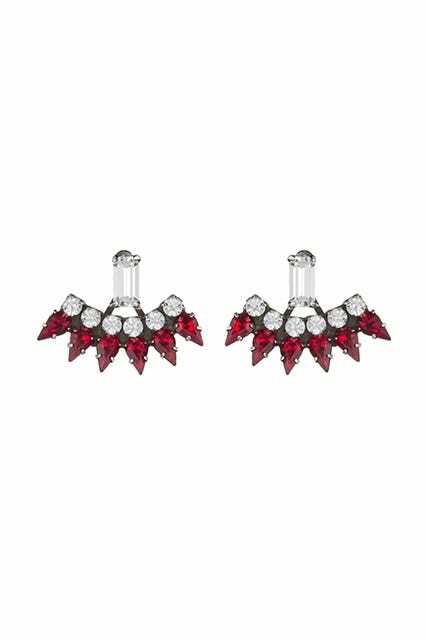 These tulip earrings are a ladylike addition to any jewelry box. In fact, you can thank the women of the Art Deco age for the popularity of dangly earrings. "Newly bobbed hair called for dangling pendant earrings, sparkling bandeaus, and dramatic headpieces," Doyle says. 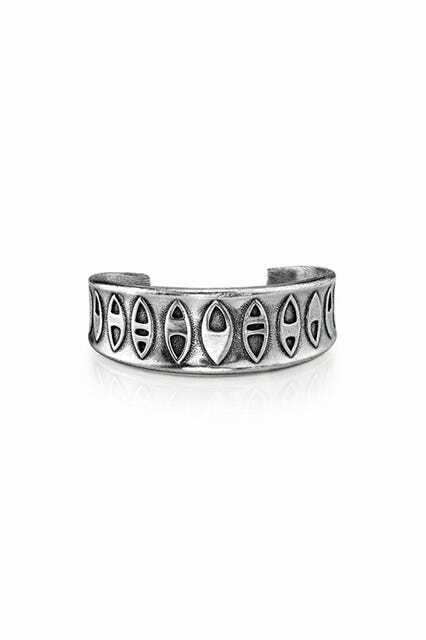 This unique ring is a great example of the abstract shapes that became popular in the '20s and '30s. Collaboration between artists led to new ways to use metals and gemstones. Lang Antiques adds, "Architects, painters, sculptors, an entire community of artists shared ideas and designs, enriching each other’s disciplines and providing inspiration from an array of new sources." 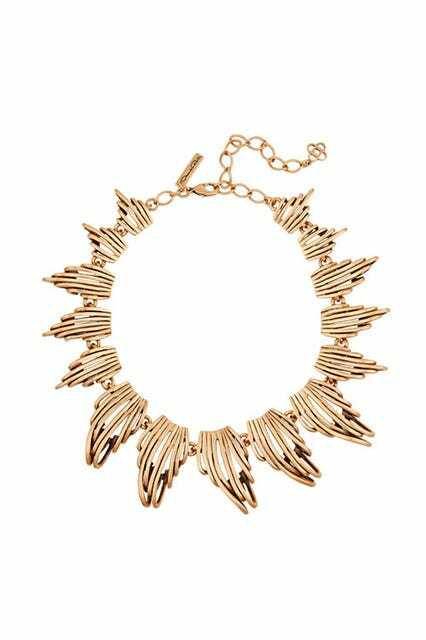 This statement collar can dress up simple tops and dresses, and features abstract metalwork that might lead you to say, "What exactly are those?" That's the beauty of abstract jewelry. Kate Spade does Deco the dainty way. 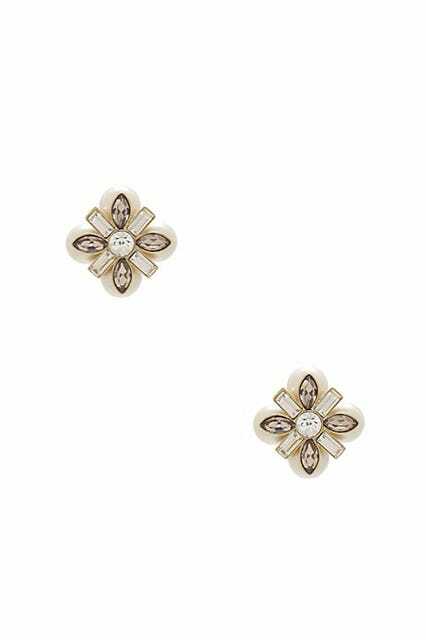 These earrings may look floral, but they're actually made of smaller geometric shapes and are perfectly symmetric. 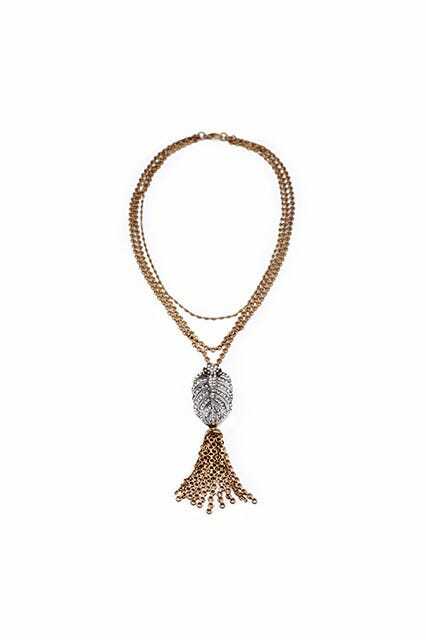 If the masculine, hard lines of the Art Deco period aren't quite up your alley, you can't go wrong with a bit of flapper-like fringe with this necklace from Lulu Frost. Aside from art, architecture, the machine age, and the women's suffrage moment, Art Deco style was also inspired by ancient Egyptians. Doyle explains, "The discovery of King Tutanhkamum's tomb in 1922 sparked a renewed interest in Egyptian Revival designs, which were often crafted in platinum with Egyptian motifs created with calibre cut colored stones and pave diamonds." "This is really a trend right now in both antique and market jewelry," says Weiner. Both then and now, the motifs of ancient Egypt can be adopted in an elegant and sophisticated way. 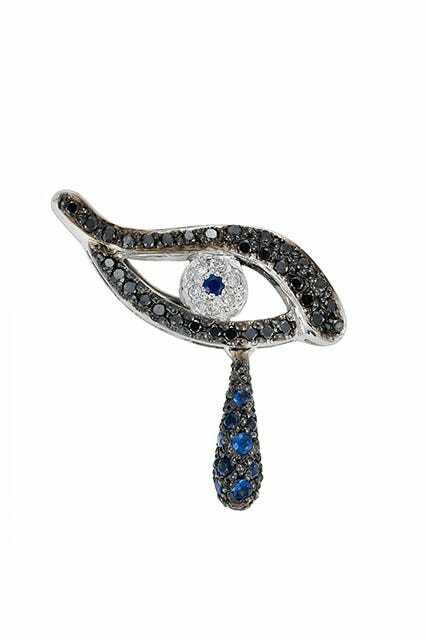 You can wear this piece as a single stud, but if you really want to feel like a character in Great Gatsby, you'll pin it onto a dress or jacket as a brooch, instead. This scarab-like design gives an edgy, Egyptian twist to these not-your-average pearl earrings. As stated on the Lang Antique & Estate Jewelry website, "Figurative representations of lotus blossoms, pyramids, the eye of Horus, scarabs, nearly anything from the ancient time of the pharaohs, was fair game as a jewelry motif." This chunky, boho cuff utilizes the eye motif, as well. Snakes were also a popular symbol in Art Deco Egyptian Revival jewelry. A sleek and subtle nod to the pharaohs.